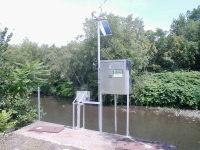 LOCATION.--Lat 41`26'28, long 75`38'33", Lackawanna County, Hydrologic Unit 02050107, at Parker Street Bridge at Scranton, 0.25 mi downstream from Leggetts Creek and 14.1 mi upstream from mouth. PERIOD OF RECORD.--August 2008 to current year. GAGE.--Water-stage recorder and crest-stage gage. Datum of gage is 708.59 ft above National Geodetic Vertical Datum of 1929. Satellite telemetry at station.